This article is only required when upgrading from Pega Customer Service (formerly Customer Process Manager, or CPM) 6.2 and prior versions. Prior to CPM 6.2, a FrameworkDeveloper portal layout was used as the default desktop for developers. This is no longer supported, and its capabilities have been replaced by Designer Studio and related Pega Customer Service landing pages. You can update any site-specific developer access groups to use the standard Pega 7 Platform Developer portal by doing the following steps. From the CASysAdmin drop-down menu, select Access Group. 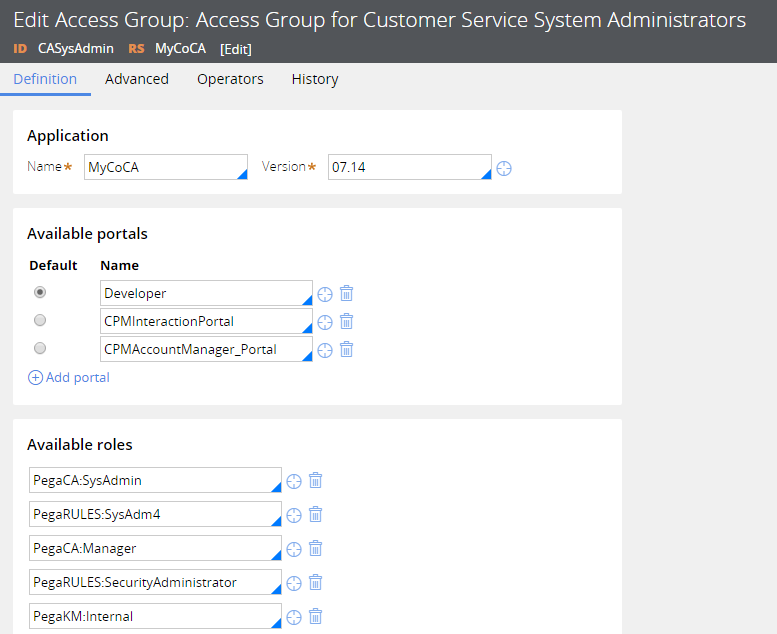 From the Definition tab of your site-specific access group instance, change the Available portals to use the Developer portal, as displayed in the following image. If applicable, remove FrameworkDeveloper from your list of secondary portal layouts.